One of my favorite drinks is an ice cream float. 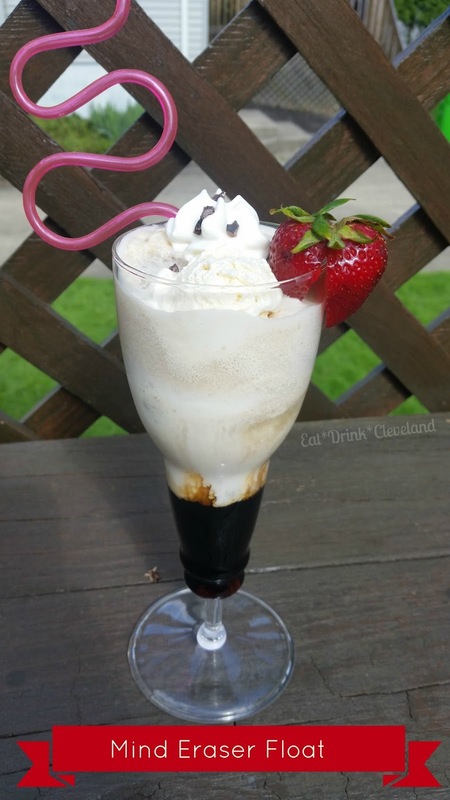 The mixture of soda and creamy ice cream is irresistible and tastes like summer in a glass. From the first time I tried a Mind Eraser, I knew it would make a delicious float for my Kahlúa® Cocktail Series. The best part about it is that you can customize it to make it your perfect sip. 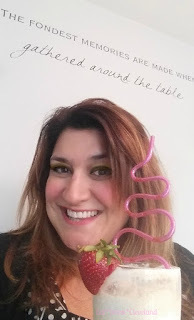 We were just in Sonoma and there were gorgeous strawberries everywhere! This cocktail captures that summery flavor and will have you thinking of cookouts and drinks on the deck. Pour one part Kahlúa® into a tall glass. Next, carefully add one part vodka. Add one large scoop of ice cream. Gently pour vanilla soda into glass. 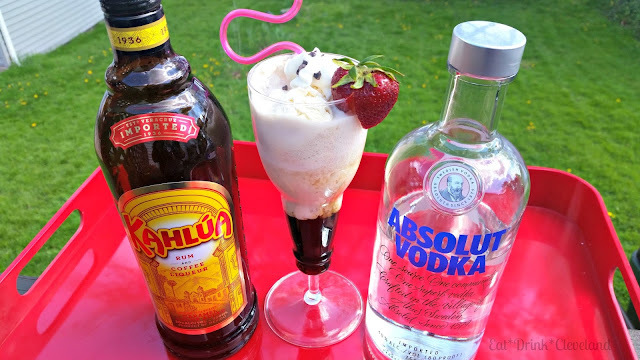 Garnish with strawberry, whipped cream and chocolate. Add straw and enjoy! 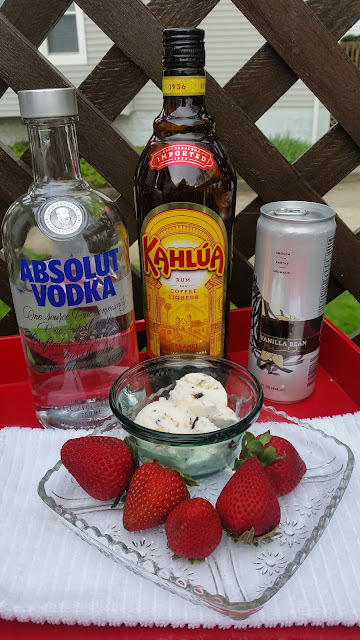 I loved the strawberry flavor but another personal favorite was the vanilla ice cream and vanilla soda combo with extra strawberries for dipping into the drink - simple but soooooo yummy! Coconut ice cream is another great option. But you can go as crazy as you want - the options are endless. If you want some added texture, use a chunky ice cream like chocolate almond or rocky road. Customize the garnish for you combination - maybe maraschino cherries, a banana slice or chopped nuts are more your style. What combo will you try? May is one of my favorite months of the year and this year it's even a little better because Our Lady of the Wayside's Grapes and Ale is early this year thanks to the upcoming RNC. 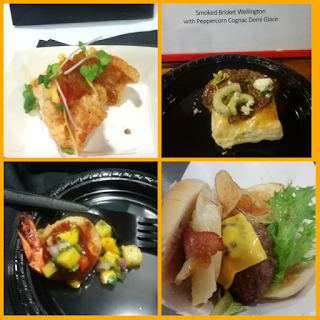 It will be quite the party at Progressive Field as with samples of delicious summer food and 300+ wines and craft beers. Your ticket includes dessert from Becker's Bakery and Pierre's Ice Cream. Guests will also have access to The Corner where they can enjoy samplings of craft beers (tickets are $5 for 10 samples or $10 for 20), a souvenir glass, Chinese Raffle, music by Ace Molar and more! Admission to the Premiere Grand Tasting includes everything in the Premier Tasting as well as access to the VIP area located on the 2nd floor of The Corner Bar. You will sample great food throughout the evening from Agostino's Catering & Event Center, dessert from Cupcake Cravings and selections from the featured wines from Benzinger Family Winery, Kenwood and Prophecy as well as craft beers from Goose Island, Blue Moon, Samuel Adams, Fat Head's, Great Lakes, Leinenkugel's, Shock Top, Henry's Hard Soda & Cavalier Distributing. Admission for one guest to the Premiere Grand Tasting where you can enjoy all the fantastic summer fare food selections and unlimited Aquafina & Pepsi. This event is always a blast! There is a ton of great food and so many wine and beer choices that you'll have a hard time choosing. Plus, Ace Molar is So.Much.Fun. You'll be dancing the night away in between delicious bites. Tickets are now on sale - click here to purchase yours! I'm giving away a pair of Premier Grand Tasting tickets to one of my readers. If you are lucky, it can be you! Enter using the Rafflecopter below. Good luck! *** Disclosure: Thanks to Our Lady of the Wayside, I was provided two Premier Grand Tasting tickets to giveaway and two VIP tickets for helping promote this event.